The HootSuite dashboard’s search streams are great for real-time tracking of keywords, #hashtags and @mentions – whether you’re on the go or at your computer. But what do you use when you want to share those Tweets with an audience? *Drum roll please* Introducing HootFeed – HootSuite’s customizable full-screen Twitter feed built for live events and digital displays. 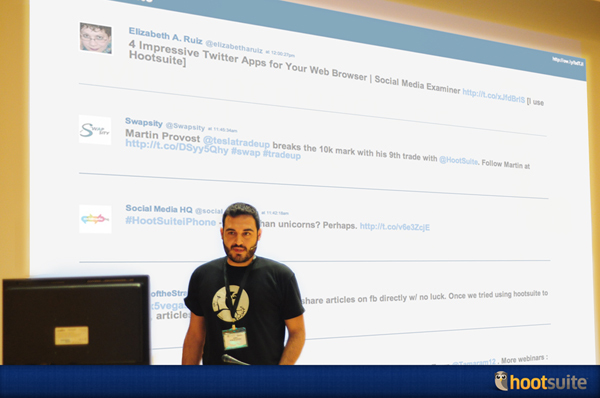 Whether you want to showcase Tweets on the mainstage or have them on LCD screens scattered throughout your event, this easy-to-customize Tweet wall animates Twitter activity onto your screens in real-time. 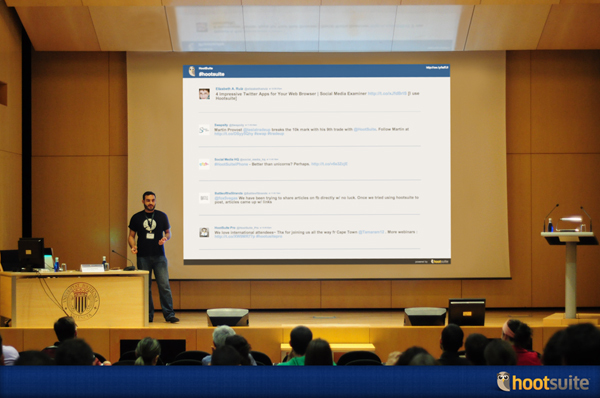 HootFeed is free for anyone to use and is a great way to engage audiences at events or busy public locations. Attendees Tweet the keywords and they auto-magically appear on the big screen. Instantly interactive! 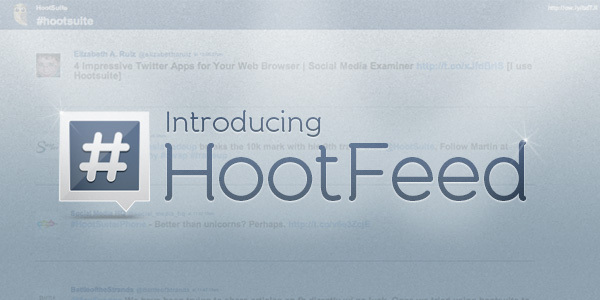 HootFeed is browser based with no installation required and only takes a few minutes to set up. You’ll need access to an internet connection, an email address and whatever video set-up suits your fancy. Input your keyword, mention or hashtag. For power users: HootFeed works with Advanced Twitter Search Operators. Toggle to add the Profanity Filter. 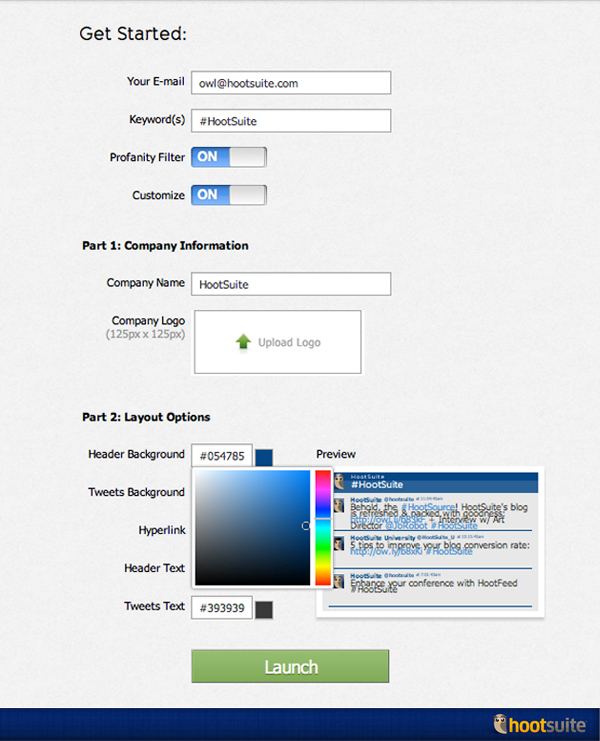 Keep it simple or customize HootFeed with your organization or event’s name, logo and colors. Press Launch and watch the Tweets roll out. Adjust the size of the Tweets by zooming in or out of your web browser. Do this by holding down “ctrl” and pressing “+” or “-” for PCs. Mac users hold down “command” and press “+” or “-”. Share your customized HootFeed with a colleague by sending the ow.ly link located on the top-right of the screen. 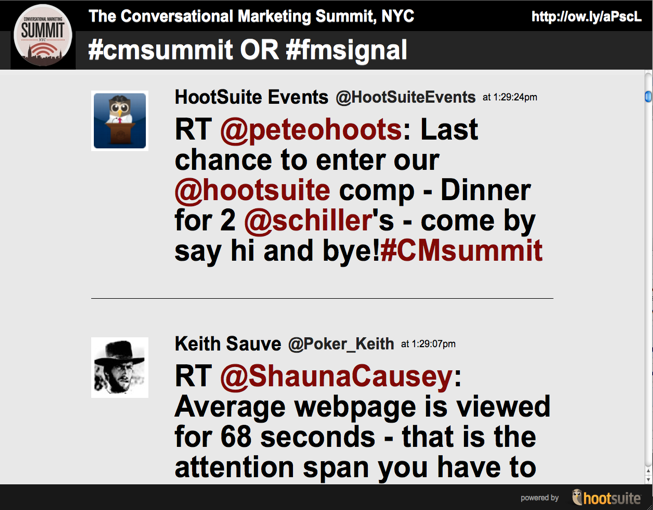 HootFeed made its debut on May 14th at the Conversational Marketing Summit in NYC where it displayed Tweets that included the #cmsummit or #fmsignal hashtag. Whether you’re an Event Organizer, Office Manager, DJ or Community Manager, HootFeed provides a simple visual solution for streaming Tweets. 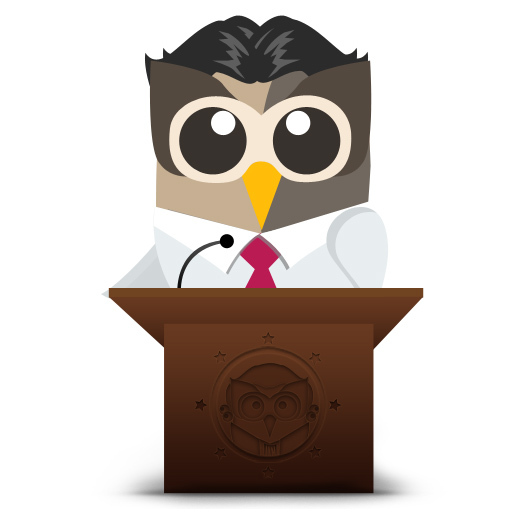 HootSuite created HootFeed in response to user feedback and requests. Share your thoughts and suggestions for feature requests on our Feedback Channel.